In the last 2 amateur boxing tournaments we have been the top club with 6 wins out of 8 matches with Club captain Mitchell “Boomer” Coomer leading the way from the front. Mitchell’s last 3 fights have all been against top Qld opposition where he beat the current Qld champion, the 2013 Australian title challenger and a seasoned senior fighter originally from NSW. 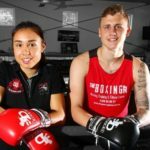 On June 1st we will travell to Caboolyure to see Mitchell box the Queensland champion for a second time and it will be the first fight in Queensland under the new scoring rule and no headguards for senior Elite Males. 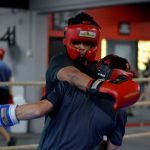 The new scoring system in the amateur game,follows the 10 point must system that is used in professional boxing and with the removal of the headguard for Elite Males,makes the sport more appealing to an audience. Our young gun,Liam Hutchinson from Mount Gravatt won his 7th professional fight with a 1 st round KO over tough Kiwi veteran Nick Toa,which now leads him to an opportunity in July to fight in Ireland with team mate Paddy Murphy. 2 time Olympian Brad Hore will contest for the Queensland professional title in Townscille on Saturday night so we hope next weeks report brings more great news.